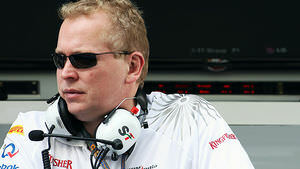 Andrew Green was promoted to the technical director role at Force India after the previous incumbent departed for Lotus. Green had previously been the engineering director but made the step up to guide the development of the car, and the team, as they looked to improve from midfield to front-runners. Green studied mechanical engineering at university, and made his debut in the motorsport industry with a Formula 3000 team. Gary Anderson joined the squad and the pair of them worked well together – so much so that when Eddie Jordan requested Anderson move to his new eponymous team, Gary brought Green with him. After spending time as a designer, Green next tried his hand at being a race engineer, working with Rubens Barrichello and Ralf Schumacher. He moved back to designing after an offer came from BAR F1, but the cars were not a success. Let go by the team, he founded his own design company, working for Jaguar which became Red Bull, and then joining Force India midway through the 2010 season.